This website is dedicated to law-abiding parents who want to raise great kids – but are confronted with a confusing law which also ignores the realities of parenting. Prime Minister John Key says that the anti-smacking law is a complete and utter dog’s breakfast, badly drafted, extremely vague. However, in December 2009, in response to an overwhelming 87% opposition to the anti-smacking law in the Referendum, John Key told kiwi mums and dads that a light smack was ok. Psychologist Nigel Latta who headed a review of the law said that “parents could relax”. But the Latta review has since been exposed asmisleading, failed to meet its Terms of Reference, and missed out or ignored key information. John Key’s assurances are in direct conflict with what groups like Barnados, the Children’s Commissioner and Plunket are telling parents, and the way the anti-smacking law is being enforced by the police, CYF and the Family Court. And in September 2010 in Parliament, all political parties, except for ACT, sent a clear message that a light smack is not ok when they rejected the very amendment that National MP’s had been vigorously lobbying for when in opposition! Law-abiding parents raising great kids are now confused. This website backgrounds the issue, provides important legal advice and encouragement for parents, and shows practical solutions to tackling the issue we all want solved – child abuse. A legal analysis of the 2007 anti-smacking law says that the law is confusing to parents, police and the legal profession; that statements and guarantees made by politicians were misleading; and that a comprehensive analysis of the effects of the law on families is impossible because of the difficulty in obtaining copies of judgements, and the absence of key data from the police. 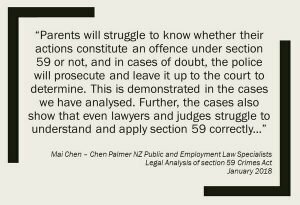 The analysis provided to Family First NZ in January by public law specialists Chen Palmer is an update of an earlier Opinion in 2014, but reviews other cases which have become relevant since that time. “it is just over 10 years since the hugely unpopular anti-smacking law was rammed through Parliament against the better judgement and will of the New Zealand people. 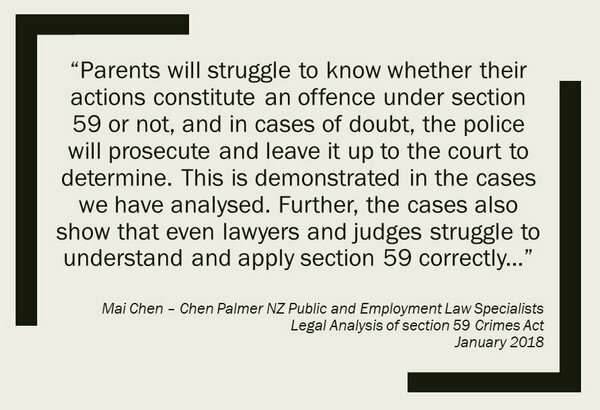 This legal Opinion by Mai Chen will sound further warning bells to families and is a rebuke to all the politicians who thought they knew better than the public,” says Bob McCoskrie, National Director of Family First NZ.